Well the rum soaked dried fruit, the Glacé Citron and Glacé Orange, and the panettone rested overnight; hopefully you are well rested too. 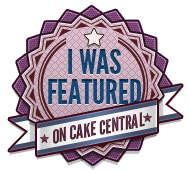 It is time to finish our panettone project, but I thought you might enjoy a bit of food history first. 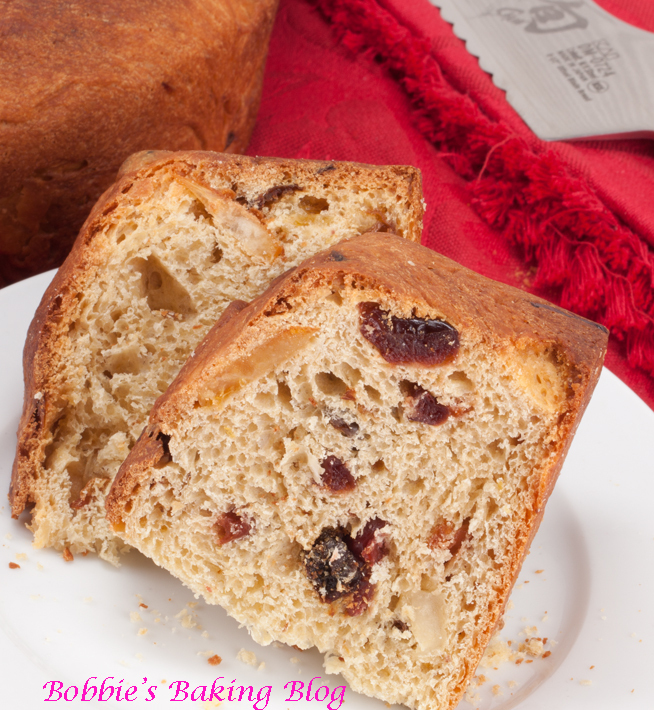 Panettone is rich traditional christmas cake/bread. Panettone made its debut in Milan around the late eighteen hundreds. Folklore has it that, Anthony, a baker, loved a daughter of a wealthy man. Being a humbled baker he needed to win the father’s approval, so he set out to bake a cake/bread so flavorful and exquisite. He added the equivalent to the gifts of the wise men; butter, brandied dried fruit, glacé citron, nuts and sugar. The man was so in awe he gave his blessing and started Anthony a bakery in Milan. Anthony being blissfully happy baked his now father in law the cake/ bread every Christmas. The name is said to be a play on Anthony’s name…”Pane Tony,” or as we now know the rich cake/bread to be called panettone. There is of course a less romantic version, but Sydney prefers this version; therefore in our home this is the story we tell to family and friends who ask about the history of this wonderful bread. 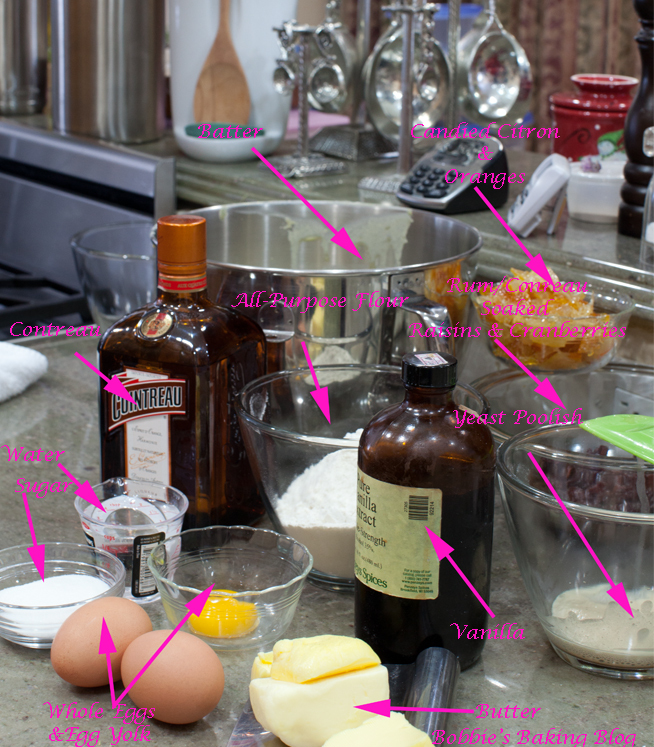 In the bowl of a standing mixer whisk together flour, sugar, salt and fresh yeast mixture till combined. Add the sponge, egg yolk, and whole eggs, on low speed with the paddle attachment until a dough forms. 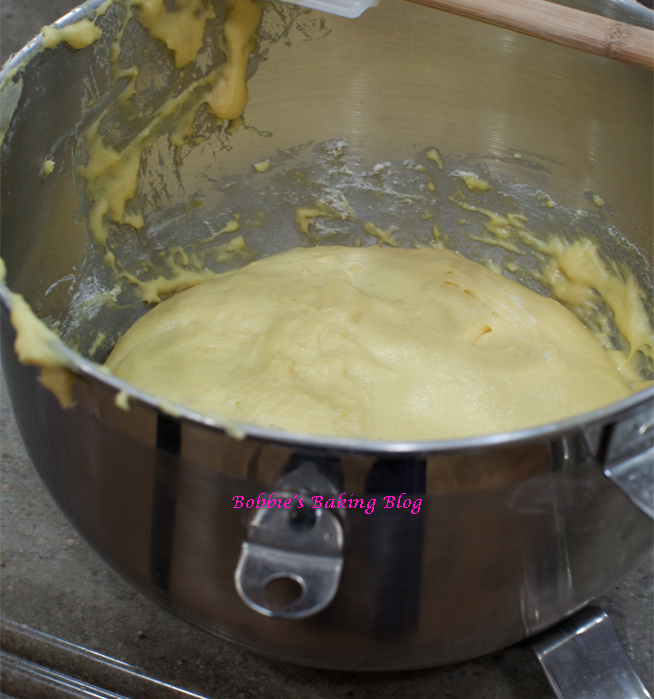 Add the warm water slowly as needed to bring the mixture into a ball, turn off the mixer, remove the bowl, and allow the dough to rest for 20 to 25 minutes. This very tired dough that needs a few naps is ready for the soften butter, rum soaked dried fruit, and glacé (candied) citron/lemon and orange slices. (Oh be sure to chop the glacé fruit into bite size pieces). Mix until evenly distributed. 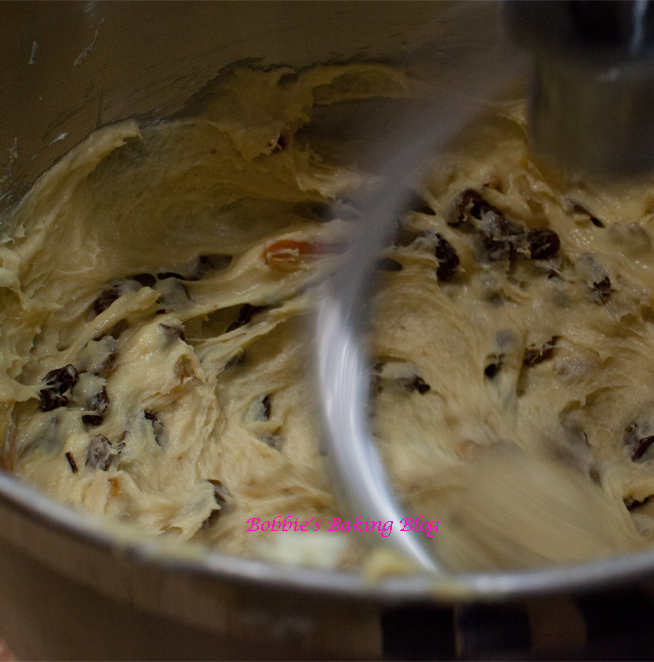 Change to the dough hook of the standing mixer and knead on low for 3 to 5 minutes. 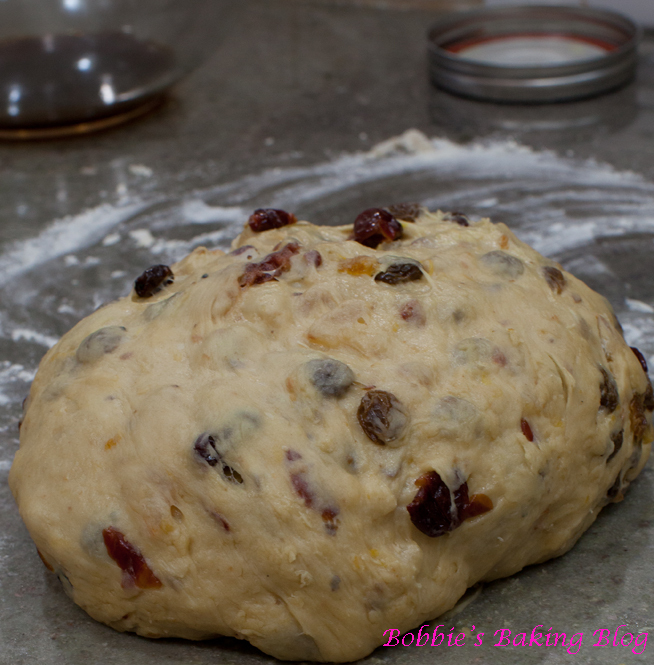 Add flour, one tablespoon at a time, if needed, and allow to knead an additional 7 minutes. Remove to a lightly floured surface, flour your hands lightly and knead by hand till the dough is soft and tacky, but not at all sticky. Place the dough ball into a lightly sprayed, with butter spray, dough bucket and cover. Proof for two hours, that dough really needs its resting time! Divide the dough in half, by weighing the halves equally. Place each half in panettone papers, spray and cover lightly. Guess what…more resting time, proof the dough for 2 additional hours. About 20 minutes from the FINAL proof, preheat the oven to 163 degrees C/ 325 degrees F. Bake the panettone for 1 hour or an internal temperature reaches 85 degrees C/ 185 degrees F.
The panettone should sound hollow when gently tapped with a butter knife. 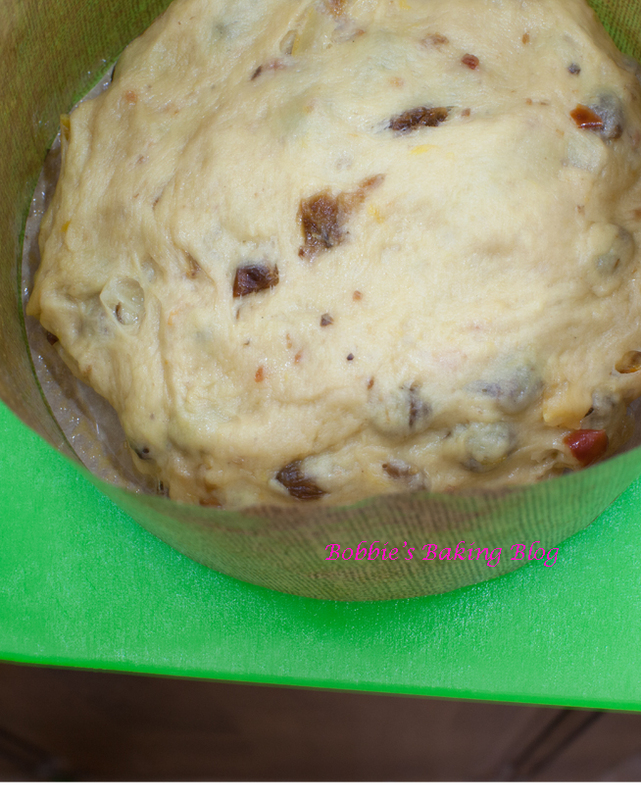 Leave the panettone in the papers on a cooling rack to cool, (I think the panettone is using this step to rest again)! 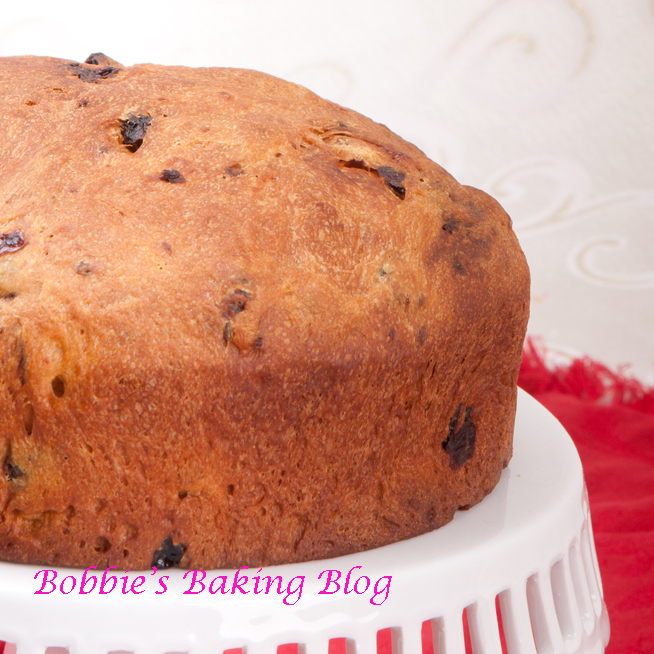 This bread keeps for about two weeks, and is perfect as is, or many people decide to add it to many desserts. According to the ancient ledger The name of the bread literally means, “bread of Toni”. The name originates from another legend during the same period of the Dule Ludovico in the 15th century. The story takes place at a large banquet held for the Duke on Christmas night. The chef had a wonderful dessert prepared but it had burned and was a huge mess in the kitchen. He didn’t know what to do as everyone was demanding he serve the dessert. A scullery boy named Toni approached the chef and explained that he had made his own bread using leftovers (such as egg and citron) for his family and friends. He offered it to the chef to use for the party. The chef, without any other option, accepted the generous offer. The dessert was a huge success, and when the Duke decided to congratulate the chef, the chef gave credit where credit was due. And hence, the bread was named after the scullery boy, Toni. Margaux, Thank you taking the time to add to the history of this scrumptious bread!